Faithful reproduction of the sword of Marcus Aquila, produced by Windlass and from the movie "The Eagle", the epic film of 2011 with Channing Tatum and film adaptation of the novel "The Eagle of the Ninth Legion" by Rosemary Sutcliff. The Tryceratops, small, compact and very robust, born from the idea of being able to have with him a knife reliable in different situations even with minimum dimensions. Very sharp, comfortable and easy to handle, the knife Tryceratops is a great demand from American hunters and operators. Notes: Bevel low, type scandi - each knife is unique as it is handmade, might therefore be small differences or inaccuracies with respect to the photographed model, also with regard to colors of blade and handle. It has a blade razor, as is fitting for a tool created to cut and not just to be exhibited in glass cases. Simple but charming traditional knife produced in Italy and famous in the years 80/90 for camping / hiking. ATTENTION: since it is natural material, the color of the horn may be different from that in this photo. ATTENTION: since it is natural material, the color and shape of the horn may be different from that in this photo. The Lynx is designed to satisfy all users in the 'scope of the Hunt, the Bushcraft and Survival. Thickness and size have been designed to facilitate precision work and at the same time be reliable even for heavy work. Maneggievole and compact and ideal for the port scout. Finally a thrower among the ultra-compact! With models EA11 and EC11 Nitecore he can propose two torches extremely compact capable of emitting 900 lumens of light with real and a net center spot - well defined and devoid of artifacts - up to 190m. of distance. Two small jewelry power and miniaturization! 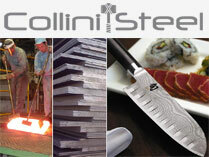 Cutlery Collini is the official distributor for Italy torches Nitecore. Container single multifunction pocket with hidden compartment for banknotes and key ring with adjustable drawstring. * Pass a clean cloth and wet the surface and wait for the product to dry naturally. The range of fixed blade knives Lion Steel has added a new model to 4.55 inches. The goal is to create a knife to all, easy to carry and effective use. The range of fixed blade knives Lion Steel has added a new model to 4:55 inches. The goal is to create a knife to all, easy to carry and effective use. This beautiful folding knife is a highly sought after accessory, whether it is used as a knife gentleman, both as a personal steak knife. The style of knives Higonokami was the first product in Japan, it could already be found in 1896, during the Meiji period. A key feature of the design is traditional Higo Nokami pin protruding blade opening closed, which allows you to open the blade smoothly even with one hand. The Shun Higo Nokami not only includes traditional pin opening, but also brings improvements to the original design also going to integrate a system of block-type blade Liner Lock to make the user experience more secure. E 'was also chosen to use a modern stainless steel VG10, thin and sharp, which makes the Higo Nokami perfect for use as a personal steak knife. The Pakkawood handle is decorated with a mosaic inlaid center pin. Kiku Matsuda is a great fisherman and model Momose Gawa is his favorite for fishing in the river. Handle Metamorphosis: it is an aluminum shaft with a special heat sensitive coating. Normally the handle is true, but when the temperature reaches 22-23 ° C, it changes color! If you hold your knife in your hand for a few minutes, the handle becomes black Camouflage.